As a soloist, his performances consist of concerts in various concert halls within Europe, the United States, and Asia. As an educator, he has taught courses or masterclasses on three continents and works at the Madrid Royal Superior Conservatory of Music, were also is Head of Wood Wind Department. He was the founder of the Spanish Saxophone Association, Artistic Director of the First European Saxophone Congress and also President of the European Saxophone Committee. 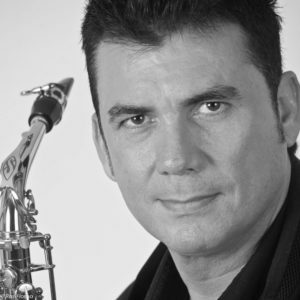 Francisco Martinez uses the Selmer saxophones and the D’Addario reeds. He is the founder and artistic director of the Sax-Ensemble and programs the “Music for the Third Millenium” concert series. This year he will perform at the Zagreb World Congress, Santander Festival Music, Lazaro Galdiano Museum, Royal Academy of Fine Arts in Milan, Oporto, Madrid. You can visit his activities project or his biography. For more information or to visit his blog, see the Spanish version of this website. Cruz de Castro builds his “Concert” with very simple materials, as usual. The orchestra is, in the extreme parts, a great percussion instrument… the soloist part austere and difficult to play at the same time, which was marvellously performed by Francisco Martinez. “Really exemplary interpretation… The activity of Francisco Martínez, as a saxophone soloist and as conductor of the Sax-Ensemble, has proved to be unpayable regarding the diffusion of his instrument in Spain, in general as well as in the specific field of contemporary music. “Admirable sound – With the alto and the soprano saxophone – Perfect air column, as well the “bow” movement in string instruments. Excellent vibrato and very talented lyricism. My congratulations in the name of the “good saxophone”. You are “Grand” with the instrument. –––BRAVO!!! Sheridon Stokes – California USA. He is one of the saxophonists who has contributed most to the saxophone repertoire in the last 30 years. His activity has led to the world premiere of 203 works for saxophone and the publication of 18 CDs and 2 DVDs so far. He has performed in over 20 countries in the Americas, Asia and Europe and has performed five world premieres of concerts with orchestra. As an interpreter he is greatly appreciated for his sound, technique and quality of interpretation that has earned him the highest acclaim. He is the founder and artistic director of Sax-Ensemble Group. This group is considered one of the best contemporary music groups in Europe and is the largest contributor to the international repertoire of saxophone in the last 20 years. It was the first group of chamber of Spain awarded the National Prize for Music. He is a saxophone professor at the Royal Superior Conservatory of Madrid and also Head of Wood Wind Department. His training at conservatories in Madrid and Alicante, and later in Paris, Bordeaux, and with the most renowned professors of the French school have allowed him to be one of the best prepared teachers in Spain. Many students have passed through his classrooms and more than 70 teachers have completed their saxophone studies in his classrooms. He has taught courses and masterclasses in addition to Spain, Russia, Poland, Germany, Italy, France, Belgium, Holland, Portugal, Slovenia, Canada and the United States. He was the founder of the Association of Spanish Saxophonists, and organizer of many activities to promote the saxophone in Spain. In 1987 he organized in Alicante the II European Saxophone Meeting, where the Sax-Ensemble performed for the first time. Later he taught the first Saxophone European University in France (1989), and founded the Saxophone European University in Spain (1990). In 1993 he founded the Sax-Ensemble foundation which is currently the artistic director and which organizes the cycle Music for the Third Millennium. He is currently president the Governing Board of the Foundation Sax-Ensemble. He was artistic director of the I European Saxophone Congress “Eursax 2014”. Also is president of the European Saxophone Committee. He has published articles in the magazine “Anuario Musical” (Higher Council of Scientific Researcho of Spain) in the revues: Music and Education, Euphony, Melomano, Ritmo, El País, Viento, Allegro, “Music” published by Royal Conservatory of Madrid and the magazine ASE.